Showfront Partners with MAGNA And MAPDA Awards Ceremonies. Read more about it here in this blog post! Buy or hire beautifully hand-crafted, Australian-made museum display cases for your next exhibit. For over 20 years, Showfront has manufactured and supplied custom display cases to museums, exhibitions, art galleries, RSL's and private collectors throughout Australia. 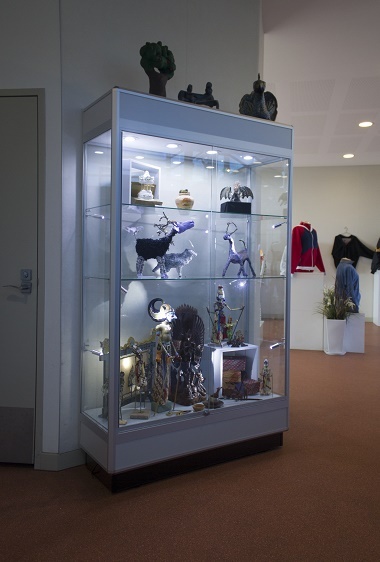 Our premium quality, museum-grade display cases are Australian-made and offer a superb alternative to other museum supplies companies on the market today. Better value and better quality are the hallmarks of the Showfront brand. We put our clients first and ensure that every project is delivered with consummate professionalism and care. Our museum-style display cabinets can be tailored to any shape, size or specification and include many outstanding features unique to the Showfront range. Cool, energy-saving LED lighting comes as standard with every Showfront museum display cabinet and there are myriad options to choose from should you wish to customise your cabinet lights. All museum display cases manufactured by Showfront are delivered fully assembled and installed on site. Our scalable museum display solutions can cater for the purchase or hire of a single museum display case to large scale exhibitions requiring hundreds. Indeed, Showfront is the largest supplier of exhibition hire cabinets on the Australian market today, and our client list extends to all regions, States and Territories, including Victoria, New South Wales, Queensland, Tasmania and South Australia. If you're looking for museum display ideas, stands, supplies, products or equipment, call Showfront now on 1300 99 36 36. Our expert display consultants will provide you with a first class, obligation-free consultation on the optimal design for your museum showcases to ensure your precious artefacts are displayed to the greatest visual effect.